The finely perforated expanded metal of the building envelope provides the rooms with evenly filtered light. 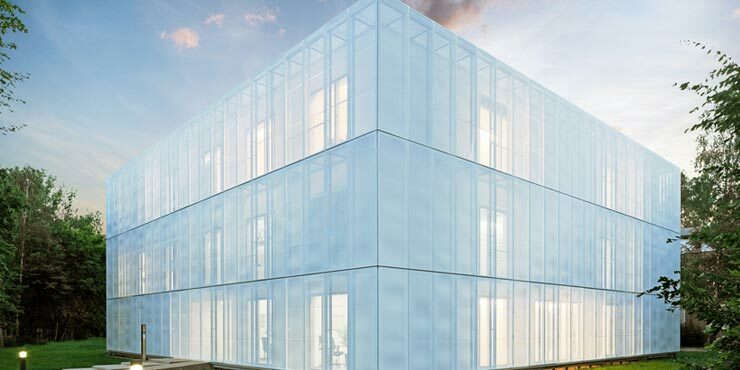 The striking façade of the cubic research building consists of white coated expanded metal. In front of each window is a storey-height folding / sliding unit, which allows for solar shading and the relationship to the outside to be set individually. In the sanitary facilities, functional GROHE faucets ensure reliable, low-maintenance and durable operation of the water faucet connections.